2, Lane 80, ShiDa Rd. I had been hearing so much about Bongos... but after a winding taxi ride around the lanes and alleys near Shi Da, we simply could not find it. The telephone number we had was not being answered. The address we had seemed to lead to a dead end. So hungry and lost, we directed the taxi to take us out to the nearest main street and spotted a charming looking Spanish looking cafe with people lingering on the patio with a little park in front of it, and that is how we ended up at Vino Vino Cafe. However, maybe we should have tried harder to find Bongos? Despite the appetizing sounding choices of pasta and main dishes on their English and Chinese menu, we ended up with some not so savory plates (NT$960 for 3 set menu lunches). Well, at least my friend did- her penne pasta was so salty it was inedible. My risotto was not bad with bits of mushroom and chicken mixed into the creamy, soft rice, but the other parts of my set menu were nothing to brag about and I felt bad that my friend didn't enjoy her food. A very plain lettuce salad and a watery soup under a not flaky puff pastry. I think the most places I have seen so many puff pastry soups is only in Taipei- it's not a phenomenon that I've seen as much elsewhere. But it doesn't mean that it tastes as good as it looks. And then a sad watered down gelatin dessert- the pale lemon yellow looked slightly like "ai-yu" or yellow jello, but tasted like someone had forgotten to add the flavor packet. Watered down seemed to be the theme- the watered down soup, the watered down dessert, the watered down ice tea, the watered down service. With so many great little Italian spots in Taipei to discover and eat at, this was a big disappointment- so don't be lured in by the good looking facade unless you just want to hang out on the patio. So I'm headed back to Taipei after lots of great food and travels in the states- so don't worry back to your regularly scheduled programming soon. 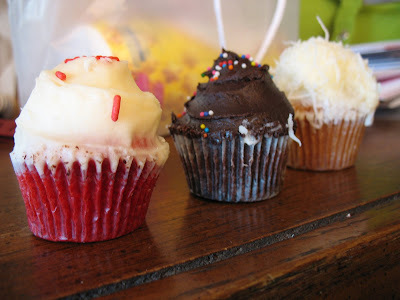 But I had to share a picture of the adorable and delicious cupcakes I love from Auntie Em's Kitchen. I would much rather eat these than the overrated cupcakes from Sprinkles- even though I have to trek to Eagle Rock to get them. The picture is of their mini cupcakes which go for $1+ - and their regular sized giant cupcakes ($3+) are almost as big as a pint of ice cream with a helmet of frosting and the dense yet moist cupcake underneath- definitely enough to share, but only if you felt like it. Personally, I love the red velvet and the coconut. These may be the best red velvet cupcakes I've ever had- and yes, better than the ones at Doughboys (a bit heavy) and Sprinkles (not as moist)! The cream cheese frosting of the red velvet is a bit more sugary than smooth cream cheese, but works with the less sweet taste of the moist red velvet. The coconut shavings mesh with the slightly lemony cake. There's also chocolate (which is on the dark chocolate side to me) and carrot. There also a ton of other freshly baked pastries- and oh yeah, they serve food. Delicious homestyle food, sandwiches and salads and a mean strawberry lemonade. Eat it in their cozy cafe style restaurant after ordering at the counter, or get it to go. 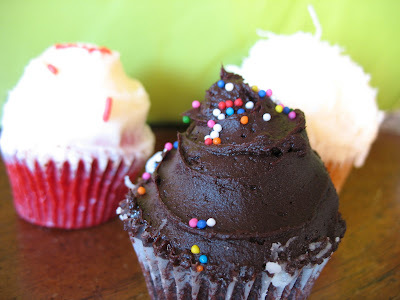 Either way, I am going to be drooling and daydreaming about these cupcakes on the plane all the way to Taipei.